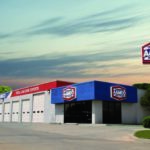 Franchise Times, a leading publication covering the franchise industry, recently published an article entitled, “Car repair franchises stay steady on rough road,” praising the iconic AAMCO franchise for adapting to the technological advancements and challenges facing the auto industry today. AAMCO is intent on preparedness and education to ensure that its network of 630 franchise locations are thriving and well-ahead of new technology trends going forward. 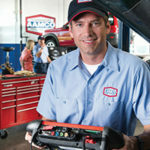 The article praises AAMCO’s state-of-the-art training platform, AAMCO University, which helps to attract and retain the most qualified technicians in the markets AAMCO franchise centers are located. This commitment to training helps AAMCO franchisees provide a solid, well-paying career path for technicians that emphasizes advancement and opportunity. 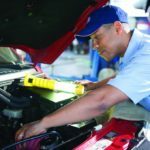 Naturally, this approach has helped franchisees recruit and retain the best and brightest technicians in the industry, while also increasing both sales volume and the customer experience at AAMCO franchise centers. In the article, Brian predicts that as cars become more safe to drive, more and more and Americans will continue to rely on their vehicles, and more members of a household will have their own cars. Judging from the fact that AAMCO plans to open 30-40 stores and has secured 18 real estate locations to evolve alongside the changing needs of the auto industry, the iconic brand will continue to grow well into the future. With nearly 650 centers across North America, AAMCO is actively seeking single- and multi-unit operators who are passionate about the brand and committed to providing the highest-quality service. Interested candidates should have a minimum net worth of $250,000 and liquid assets of at least $65,000 per unit. Depending on the real estate site selected, franchisees can expect the total investment to be approximately $226,300 – $333,500, with a $39,500 initial franchise fee. Reduced franchise fees are available for honorably discharged veterans.